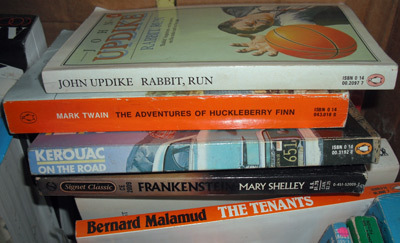 Over Christmas I came across a box of old books that had been gathering dust in an attic ever since I left university. A lot were pretty useless, except as curiosities — a book on American foreign policy that goes up to about 1982 would give quite a rose-tinted perspective. However, I managed to pick a good dozen or more novels that are taught just as regularly now as they were a couple of decades ago. I must have learned to read literature to take into account the Afro-American perspective reasonably well as I think I got a B+ on that course. There’s also quite a few books by 19th century American novelist Nathaniel Hawthorne. I did a year-long course in my final year at Birmingham taught by Brian Harding, this country’s greatest expert on the writer (at least at the time), who’s since edited many editions of Hawthorne’s work. That was in the days when we were taught in a weekly tutorial for five students — all sitting in Dr. Harding’s office (at the time the one next to David Lodge’s) around a big table: great for in-depth discourse on one of the most influential authors developing the American literary tradition but not so good if, like me, you’d been in the pub instead of reading the works beforehand. Somehow I managed to get a decent mark in my finals on Hawthorne but the enduring image I retain from that course was when an attractive but quiet female student called Gill (I wish I could remember her surname) once turned up in fishnet stockings and leather boots. I still remember watching her, quite stunned, walking down the English department corridor. The Orwell ‘1984’ as well as Mary Shelley’s ‘Frankenstein’ came from another UCSB class — taught by Professor Frank McConnell who was the most popular lecturer at the university. He was described as being Â ‘known for his renegade lifestyle and his love for teaching’ — unfortunately this was in an announcement made by UCSB when he died in 1999 aged only 56. Sadly, his renegade lifestyle probably contributed to his early passing away. 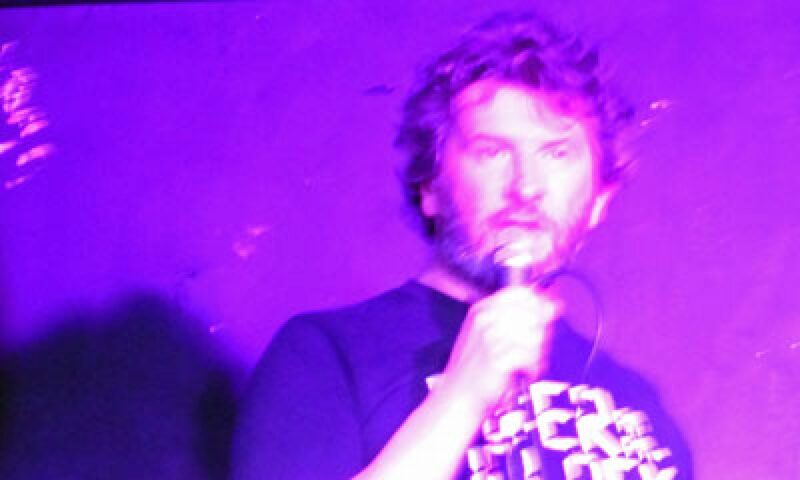 I remember him doing Roger Daltrey impressions, swinging his microphone in front of a huge lecture theatre full of hundreds of students — rather different from the Hawthorne seminars. 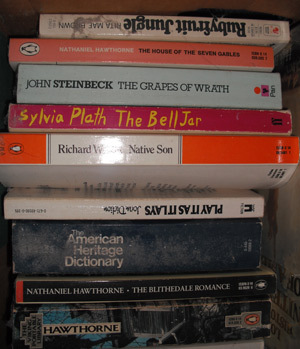 There are other iconic books in the pile — Steinbeck, Updike’s ‘Rabbit Run’, Kerouac’s ‘On the Road’. 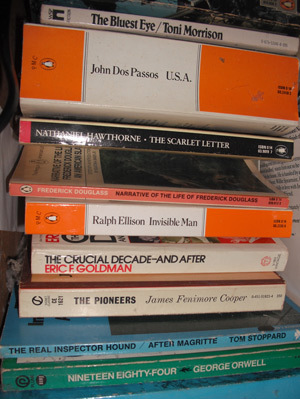 I don’t have any recollection much of what’s between the covers of John Dos Passos’s ‘U.S.A.’ — I was never going to let a book that thick stand between myself and the student bar or pub. The Tom Stoppard play was one I appeared in when I was in the sixth form — not sure how that got in the box. Any guesses what subject I studied at Birmingham?